Reading Terminal Market is an indoor market in downtown Philadelphia. 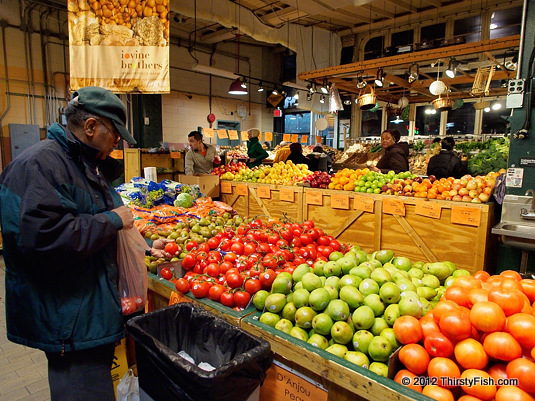 Opened in 1892, after open-air markets fell out of favor with the general public, it now hosts over 100 merchants, that offer fresh produce, dairy, farm stands, flowers, crafts, books, and ethnic foods. The market is especially popular for its culinary treats and unique merchandise. Pictured above is a fruit and vegetable store that offers fresh local produce. Mom and pop stores and local markets offer experiences vastly different from the mall culture that dominates consumerism. Last weekend, in the news, there was a story about a mall riot over Nike sneakers that were meant to be released at midnight. Sadly, materialism is turning people into savages! Another reason why movements like Occupy are going to have an uphill struggle; People have already been transformed into consumer zombies. Do yourself a favor, skip the mall and visit your local markets for a change.